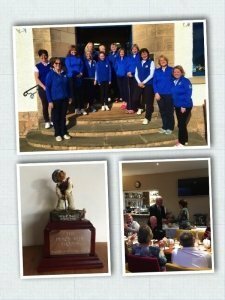 Our East Lothian Ladies Squad team played the annual match against the Gullane Men for the Percy Vere Trophy on Sunday. The matches were all very close and it is with great pleasure that I can say that we won the trophy this year 3 1/2 – 2 1/2. 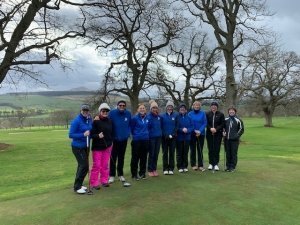 Congratulations to Kay Lannin, Jill McNicoll, Susan Penman, Ann Sewell, Barbara Biggart, Elinor Blair, Grace Crawford, Gail McKill, Mary Lou Watkins, Pam Hall, Hazel Saunders and Karen Fullerton for representing the County. Many thanks to Gullane Golf for inviting us again and hosting us to the golf and a magnificent high tea. The squad started training sessions in December with Martin Huish at his Trackman Studio in Fenton Barnes. We will have another session on the short game shortly. We have had a match against Lanarkshire and only just lost 3-2. We have a match against the Borders in March. 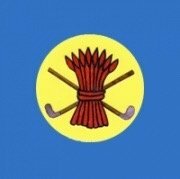 There are more matches planned against the Gullane and the North Berwick men. We have some 4sms practice sessions on Kilspindie and Gullane 3. Kilspindie was unfortunately cancelled due to the weather. Thanks to both clubs for allowing us to use the courses. The emphasis this year is focussing on personal performance and team building. 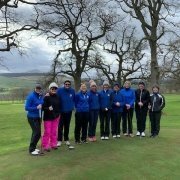 This is all working towards selection for an 8 woman team to represent East Lothian at the Inter County Matches. These will be played at Ladybank GC, Monday 1st to Wednesday 3rd July 2019. Your support will be most appreciated. Some of our players are in the USA on scholarships and therefore not around for most of our training sessions. The selection for the Jamboree Team will be made after the finals of the Spring Meeting in April and the play offs on the 5th and 6th May.